Do you have an old kit that need some life put back into it? Are your drums not sounding a good as they can? Are your drums not tuning as well as they should? 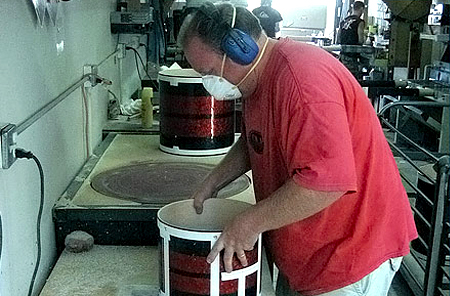 Pork Pie offers an edge cutting service to make your drum sing again. All the edges at Pork Pie Percussion are cut by the owner, Bill Detamore. Then, sanded and finished by hand. Your drums will sound brand new or better! Toms from 8”- 16” get a 45 degree cut on the inside with a round over counter cut. 18” Toms get a 60 degree cut on the inside with a round over counter cut. 15”- 16” Toms get a 45 degree cut on the inside with a round over counter cut. Bass drums get a 60 degree cut on the inside with a round over counter cut. Any size snare drum gets a 45 degree cut with a round over counter cut.